I got the 3rd pressing of the not really that new anymore LP from Iron Chic called Not Like This. I can't really remember if I own the 2nd pressing though. I've been so damn busy lately the only way I can find out about records is if I have something to do with either the selling or the manufacturing of them. And I tell you if it weren't for the Saved Search feature on the eBay iPhone app, and the email alert feature on The Old LP, I wouldn't find any used stuff either. 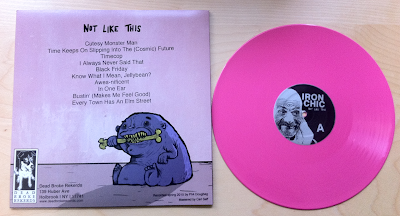 Something strange, I thought I wrote about the first copy I got of this, but in looking over my posts, I guess I didn't. That was a lavender type color out of 100 maybe. Not completely sure. These guys are playing soon with RVIVR and Rations, which I'm pretty excited about cause I've never seen either of these bands live. Hmm and I think I've only seen IC like twice. 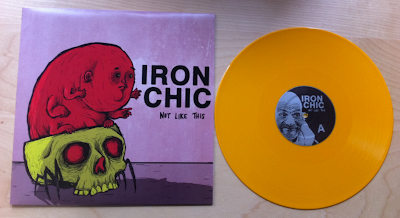 I assume everyone that follows this blog owns something by Iron Chic, or at least has heard their music. But if not you can check them out here. Lavender is 2nd pressing. 1st pressing color is "Mystery Color", which was an Orange creamsicle type color. Both 1st and 2nd pressings also had Black vinyl. ;) Thanks Nick!